What is a dinosaur? We all know the answer to that question, don't we? Dinosaurs are those giant and familiar extinct reptiles, Triceratops, Tyrannosaurus Rex, and Stegosaurus that lived during the Triassic, Jurassic and Cretaceous periods, right? Well, yes those are all dinosaurs. But not ALL reptiles that lived in the Mesozoic Era belong to the group of animals that scientists call Dinosauria. First scientists learn about dinosaurs by studying their fossils. Fossil dinosaur bone , dinosaur coprolite, stomach contents, dinosaur eggs, and other trace fossils like footprints and gizzard stones all help us learn more about these remarkable creatures. Of course the bones tell us about how the dinosaur looked, how big it was, anatomy, and much more. Stomach contents and coprolite tell us what they ate. Whole trace fossils help to fill in the picture about behavior. Scientists classify, or organize, the dinosauria according to their characteristics. Like mammals, who have hair and mammary glands, or birds with feathers that lay eggs, different dinosaurs had special physical traits that set them apart from one another. When considering which animals or dinosaurs to group together, scientists look for common traits or characteristics. The idea is that if two animals have the same characteristic they must have shared an ancestor at some point in the past. These shared characteristics are called synapomorphies. Dinosauria are no different than any modern species: when it comes to grouping them together, scientists are looking for traits that are the same. In fact, paleontologists use some of the same traits to group the dinosaurs as biologists use to group the modern animals. You probably know some of them already, so let's take a look! All dinosaurs were vertebrates. They all had skeletons with back bones that surrounded a nerve cord. Another thing we know is that all dinosaurs were amniotes. The amniotes are especially adapted to survival on dry land. Their eggs had special membranes to protect the egg in a dry environment. Fish and amphibians do not have this ability and so they must lay their eggs in water. Birds, mammals, and reptiles including the dinosaurs are all amniotes and so they are able to lay their eggs almost anywhere. Very few mammals lay eggs. Instead, the mothers carry their babies inside their bodies. The amniotic membrane protects the babies as they develop. Dinos were reptiles...sort of. One of the defining characteristics of reptiles is that they are cold-blooded. But ancient Mesozoic reptiles often had a blend of warm-blooded and cold-blooded traits. So you have to watch out for making an assumption about whether ancient "reptiles" adapted their body temperature to the surrounding air or water, or did not. Dinosaurs were diapsids. This means that they had two holes located above and behind the eye sockets on each side of the skull. The word sort of clues you in on the meaning: di means "two" and apsid means "arch." The holes look like two arches near the eye sockets. They were pretty important holes because they allowed the large and often powerful jaws to open wider and strike with more force. Jaw muscles went through the two holes and attached directly to the top of the skull. Dinosaurs were archosaurs. The short explanation of this has to do with one additional hole in the skull. 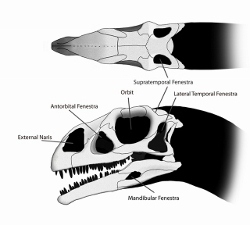 Archosaurs all have a hole, called an antorbital fenestra, between the nasal hole (the Naris) and the eye socket hole (the Orbis.) Living members of this group include birds and crocodilians. Other extinct members included the pterosaurs. Finally, dinosaurs had legs that were positioned directly under their bodies. This made them better able to walk and run and, in general, to support more weight than legs positioned to the side as in other reptiles. Which leads us to understand that all true dinosaurs were land-dwellers. The huge marine reptiles like mosasaur, plesiosaur and ichthyosaur, were not dinosaurs. A simple way to tell? Check out their skulls and look for those tell-tale holes that identify the archosaur and diapsid. You won't find them! And then there's the very real connections with the flying "dinosaurs": the pterosaurs. They have both the antorbital fenestra and the two holes that make them diapsids. So while the ancestral split between dinos and pteros occurred a long time before the two actually wound up living at the same time and place, the main distinction is the simple definition stated above: "dinosaurs were land-dwellers." Since pterosaurs were flying reptiles they can't be part of the dinosaur club. "What is a dinosaur?" And why does it matter? What these exact definitions do for us dino-lovers is keep us looking more closely at the mysteries contained in the dinosaur fossil. There is much to be found, investigated, and understood from the clues the ancient creatures left behind. Learn more about What is a Dinosaur here.